What's on my head? It's like a hair net with little sponges that measures brain activity. What's the bubble machine? It's a fancy machine that machines my body fat. Nonna & Pops babysat Reagan tonight while we went to the State Fair. We went to church this morning and then to Nonna & Pops for lunch. After a trip to the grocery store, we took it easy the rest of the afternoon. We spent the morning hanging around the house taking it pretty easy. Grannymom and Grandpa babysat from around 3:00 in the afternoon until 10:00 at night while Robby & Tara went to the Arkansas football game. The highlight of our day was dinner with Kristi & Jason Hawkins at Jason's Deli. Afterwards, we come back to the house for dessert. Jason & Kristi are expecting their first child in April! Tara & Reagan made a pumpkin cake today for Tara to take to class meeting tonight. Reagan has already been missing her Nonna & Pops who left for Dallas today. Tara, Reagan, and Grannymom met Robby at U.S. Pizza for lunch. We went to church tonight and then over to Nonna & Pops. They are leaving town tomorrow for a few days so they had to make sure they saw Reagan before leaving. It will be the longest they've been gone without seeing Reagan. Reagan spent most of the day at home today. She did make a quick trip over to Grannymom & Grandpa's to help set up their new TIVO box. Some have said I never show any pictures of Reagan crying...so see below...although I had to wake her up at 10:30 at night to get these pictures! We celebrated Uncle Jason's 33rd birthday tonight at Nonna & Pops with supper, cake and presents. Earlier in the day, Tara & Reagan met Robby at the mall for lunch. Reagan took her first bath in her bathtub this morning before going to church. This was her first week in the nursery and she did great. We had lunch at Grannymom & Grandpa's where Evelyn & Jerry were visiting from North Carolina. After a quick nap at home, Chris Babb stopped by for a quick visit before we headed back to church. We capped off the evening with supper at McAlisters. We had a pretty lazy Saturday today. We got out at lunch to visit IHOP and then Nonna & Pops visited the house for a little while. Later in the afternoon, we took a walk over to Grannymom & Grandpa's. Tara & Reagan hung around the house during the day. Beverly Johnson stopped by for a quick visit. Tonight, Tara went to a recipe party while Robby & Reagan went to visit Grannymom & Grandpa. We went to Kyle's house tonight to celebrate Robby's birthday. Tara and Reagan stayed around the house today. Grannymom came for a visit before lunch and Nonna was by after lunch. We walked over to Grannymom & Grandpa's before supper for a quick visit. When we got back to the house, the Rocketts had stopped by to say hello. Robby returned to work today while Reagan and Tara stayed home. Tonight, Reagan & Tara visited Nonna & Pops for a short visit while Robby went to a friend's birthday get together. Nonna & Pops got to babysit Reagan this evening while we were at the Rep. It was the longest we've gone from Reagan -- over 4 hours! --but everyone survived and we think Nonna & Pops really enjoyed it. We went to the Rocketts this afternoon to watch the Hogs play Alabama. The Hogs lost their third in a row. We came home and hung around the house the rest of the day. We were on the go today. Grannymom & Grandpa stopped by this morning for a quick visit. Next, we went to visit Acxiom and the Academy at Riverdale. We stopped at Park Plaza Mall for lunch and then we returned to Grannymom & Grandpa's house for another quick visit. Then it was home for a little while before going to the grocery store. Nonna & Pops stopped by with supper later in the evening. This morning we got out for a little bit to visit Duck, Duck, Goose and then we had lunch at Jason's Deli. We took a few pictures this afternoon and then went to the airport to meet Grannymom & Grandpa home from Spain. We had a pizza supper at their house with Dana, Brad, Lilly & Jenna to celebrate Robby's 31st birthday. We spent most of the day at home today. Nonna came to visit and to help around the house a bit. Tonight, we went to Nonna & Pops to celebrate Dad's birthday. Late last night we got a chance to get Reagan's hand and footprints for her baby book. She slept good again last night before waking up around 6:00 a.m. Mid-morning we got out for a little bit to visit Nonna where she works part-time at New Life Resale and then it was off to visit Pops at church. Later, we went with Pops to Three Sams Bar-b-que, Reagan's first time to "eat out." We had a lazy afternoon around the house before a visit from Nonna & Pops tonight. Miss Reagan turned a week old today. Time does pass quickly. She had another restful last night -- breaking a record -- 6 1/2 hours of sleep before waking up 6:30 this morning. We visited her pediatrician, Dr. Martin, this morning for a quick checkup. She weighed in at 7 pounds and got a healthy report from the doctor. Next, we stopped by Lynda & Charlie Pruitt's for a quick visit and then home for restful afternoon. We took it pretty easy this night as well. We're batting 4 for 4 on our good nights rest - Reagan slept for five hours before waking up on her own at 4:30 this morning to be fed. Later that morning, it was sponge bath time. Reagan enjoyed the warm water before getting dressed for church. We made it to church where Nonna kept Reagan while we went to big church. A few visitors stopped by Tom's office to take a peek at Reagan. After lunch at Nonna & Pops, we made it home for a quick visit with Brad and Jenna and then a Sunday afternoon nap. We made it back for Sunday night church where Reagan attended big church with us. Then it was time to come home again. The third night was another good one -- Reagan got the majority of her sleep from 11:30 until 4:30 when we woke her up to feed. She went right back to sleep before waking back up at 7:30. She entertained a little company mid afternoon, took another stroller ride up the street before taking an afternoon nap. She made her first trip to Nonna & Pops tonight for supper and quick visit. We made a brief visit to our Sunday School class fellowship at the Goudy's before heading home to watch the Hogs take on the University of Southern California. Of course, Reagan had her Razorback outfit on and did her best to cheer on the Hogs. The second night at home went well - Reagan managed to sleep from 12:30 am until 5:30 am before we woke her up to feed her. We took a quick stroll up the block and then back home for a sleepy afternoon. Carter & Amy Babb stopped by for a quick visit. While Tara visited the Bunko group, I stopped by Dana & Brad's for supper and a visit with Lilly. 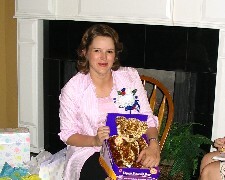 I picked Tara up at Bunko, held at the home of Nikki Chumley, and introduced Reagan to the Bunko Group. We had a lazy day around the house today. We survived our first night without any major issues. Reagan went to bed around 11:00 night last night, awoke at 1:15 when Tara changed her diaper, 3:00 when I fed her, 4:45 for a diaper change and then 7:30 for breakfast. We were able to sleep in between and felt rested when we got up at 7:30. We ended up having to wake her up at 11:30 to eat and then Nonna and Pops stopped by with lunch. Later Beebee and Papaw stopped to check on us as well. We all managed to sneak in a nap (including Pops) during the afternoon along with a quick photo shoot! The Thursday night crew brought supper to our house this week where Kennedy got to meet Reagan for the first time. Thirty-eight hours after being born, Reagan Marie was heading home to Gamble Road. Earlier in the morning, the pediatrician and Tara's doctor stopped by for their final checkup before releasing us. We arrived home to find a huge stork in the yard and a pretty pink 'Welcome Home' banner. We got settled in and unpacked. Reagan did great throughout the day and seems to be feeling at home. She's already met her two dogs, Bailey & Belle, as well! We've had another fun day with Reagan. We got checked into our regular room around 1:00 in the morning and she went to the nursery and Tara & I got some sleep. The nurses brought her back to the room around 8:30 where we had a full day of entertaining guests, feeding, and changing diapers (yes, I changed my first diaper today!). Reagan and Tara are doing great. Tara is getting around good and has walked the hall a few times and been sitting up most of the day. Tara's doctor and a pediatrician visited and gave good reports. The plan is for us to go home sometime tomorrow morning. The second night at home went well - Reagan managed to sleep from 12:30 am until 5:30 am before we woke her up to feed her. We took a quick stroll up the block and then back home for a sleepy afternoon. Carter & Amy Babb stopped by for a quick visit. While Tara visited the Bunko group, I stopped by Dana & Brad's for supper and a visit with Lilly. I picked Tara up at Bunko, held at the home of Nikki Chumley, and introduced Reagan to the Bunko Babes. Our day started at 4:00 AM when the alarm clock sounded at home. We arrived at Doctor's Hospital at 5:00 am and soon Tara was started on an IV and pitocin to induce contractions. We anxiously awaited the birth along with family and friends throughout the day. The wait extended for almost 16 hours of labor. After a successful deliver, it was time to share the news with with family & friends waiting in the waiting room. Folks began making calls to spread the news and look at a few first pictures and video of Reagan. Reagan Marie was born at 9:12 PM on September 12, 2005. She weighed 6 pounds and 15 ounces. She was 20.5 inches in length. Dr. C.E. Phillips delivered the baby with the assistance of Kelly & Diane. 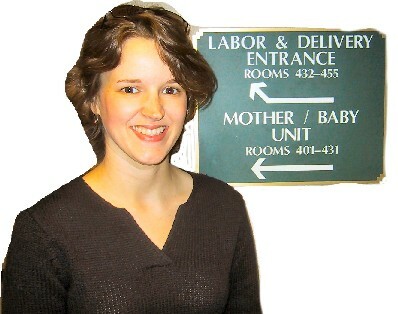 Soon after the birth, family and friends visited Reagan and Tara. We are 8 days past the original due date. I have not spoken with my parents, as of this morning, but their plane did land in Madrid around 2:00 AM our time. We are 7 days past the original due date. Tara is feeling fine and getting around great. She's made it to ladies' class meeting tonight. The doctor said he will induce on Monday, September 12th, if the baby has not come before. Several have asked -- yes, my folks did leave for Spain today. We will be in contact with them often and they will be among the first to hear some of Baby Dennie's first cries via the telephone. No major developments today. Tara is feeling fine and even made a trip to Wal-Mart. She attended water aerobics this evening. We visited Dr. Phillips this afternoon. He said the baby is still in the right position and the heartbeat sounded good. He said it was a little too early to induce and he is still hoping for a natural delivery. However, if the baby has not come on its own before Monday, September 12th, he will induce. Five days post original due date and we're still waiting on Baby Dennie. Tara has a scheduled appointment with Dr. Phillips this afternoon. We'll update as soon as we know more. Tara is feeling fine and getting around and out without any problems. Well, after three meals of Mexican food last week we're thinking might have to move to meals fully of curry. Maybe not... We're being patient and still anxiously awaiting Baby Dennie. Itt looks like September 1st is going to pass without a new baby. We had a fairly active day but still no baby. We even had Mexican food for the third time this week....oh, we're just getting excited but know that it will be here in God's timing. We'll keep you posted. We visited Dr. Phillips again today. He said everything looked in good order and that he would probably see us back in the office next week. He said the baby's head was definitely lower than last week and the pregnancy was progressing normally. Tara has reached Week 38 and she made a visit to Dr. Phillips for her ninth checkup. Her appointment was at 4:00 but the doctor was delivering a baby so she had to wait a bit before her checkup. Everything still looks good and he said he would see us back next week. Also, we hung a few picture frames in the nursery. I think we've got most items in place and now all we need is a baby! Friends from Acxiom hosted a shower for us at Vermillion Water Grille during lunch today. We were showered with great gifts and some fun stories related to rearing a child from infancy through teenage. On the eve of Tara's 37th week of pregnancy, we visited Dr. Phillips for our eighth appointment. He said the baby was definitely head first and he would see us back again next week. I think we have bought our last stroller! We bought a travel system today which includes the car seat along with a regular size stroller. We put it together tonight and attempted to install the stroller base in Tara's car. Tara had a baby shower today hosted by Stephanie Rockett, Amber McGuire, April Pennington, Kim Norton, and Gwen Folwer. Along with food and drink, friends and family showered us with all kinds of gifts for our baby. Thanks to everyone! We met our pediatrician for the first time today. Her name is Dr. Dawn Martin. She is affiliated with All for Kids Medical Clinic on Autumn Road in Little Rock. She introduced herself and told us a little bit about herself and the clinic (she has an 18-month old herself). There are six different doctors affiliated with the clinic. We'll meet her or one of them soon after the baby is born and then we will have our first real appointment with her 3-5 days after the baby is born. We had signed up for the infant care class along with all the other classes (child birth and CPR). Well, we ended up being the only ones in the class so we received some one-on-one instruction for picking up the baby, bathing the baby, feeding the baby, and lots of good advice. Linda Frazier, the nurse from our child birthing class, was the instructor once again. Tara and I visited Dr. Phillips again today. He checked the heartbeat, measured Tara's stomach and asked if we had any questions. He said he would see Tara back in two weeks. We found another good deal on a stroller - this time a jogging stroller. I'm not sure how much jogging it will see but we thought it would be a good stroller to have for around our neighborhood with its big wheels. It should make for a good walking stroller for the curbs and sidewalks. It came from Overstock.com and was fairly easy to put together - basically attach the wheels and tighten. We attend the infant child cpr class tonight which covered accident prevention, rescue breathing, CPR and relief of airway obstruction for children up to 8 years. The instructor was Gary Lambright who is also the pastor of Park Place Baptist Church in Little Rock. We wrapped up our child birthing classes tonight. The nurse shared a little a bit about what would happen if a c-section was necessary. We then visited the labor delivery area of the hospital to check out an example of one of the rooms where Tara will give birth. We stopped by the nursery as well to see of the recently born babies. Tara visited Dr. Phillips by herself today. He checked the baby's heartbeat and measured across Tara's stomach verifying she was at 32 weeks. He said everything was progressing great. We attended our first child birthing class tonight at Doctor's Hospital. Linda Frazier, one of the labor delivery nurses, was the instructor. We learned a lot of medical term, what to expect on the day of birth, plus she shared several massage techniques to make "mom" feel better. Two Outfits For One Baby? Tara's grandmother gave us some money to buy an outfit for the baby when we bring it home from the hospital. So we went to Dillard's today and bought one boy outfit and one girl outfit. Guess we will take one of them back. We spent a few hours Sunday afternoon registering for baby gifts at Target and Toys R Us. Who knows if we are registering for the right stuff but we tried to make use of the suggested lists and a little common sense. We visited Dr. Phillips for Tara's regularly scheduled checkup today. It was a quick visit and basically everything is still on target for a September 1st delivery. He asked if we had any questions and after a quick picture we were on our way. We purchased a lightweight stroller from One Step Ahead. We were able to put it together pretty easily. It's compact and easy to fold up. Tara visited Dr. Phillips for a brief visit along with her mom (while Rob was in a 3-hour meeting at work :( He checked the baby's heartbeat (132 beats per minute) and asked if Tara or Tommye had any questions. No major questions but Tommye did ask how long he let's labor go before performing a c-section. The doctor's response: "It depends!" We started adding additional decorations and furniture to the baby's room. It's starting to look a lot more like a real baby's room. Looking in there each day make us realize we really are having a baby. We put up an alphabet card border and found a nifty ABC rug as well. Tara cleared out here sewing & project room out and the transformation into a baby's room began. We painted the walls (khaki with white trim), cleaned the carpets, painted a changing table (the one Tara & Jason used as babies), put together a crib and other new pieces of furniture. Yes, Tara has reached week 20 which meant a visit to Radiology Consultants for an ultrasound. Tara's folks went with us as we got a good report and some neat pictures of Baby Dennie. With the results of the ultrasound, they have pushed the due date up by a few days to September 1st. We also made a quick visit to Dr. Phillips office for a checkup and he said things were looking good. 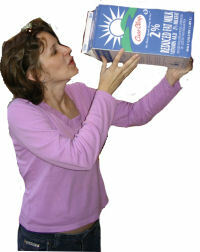 Yes, Tara is making sure she gets her calcium even while we are traveling in the Dakotas and Nebraska. We left Little Rock on Sunday, March 27th and have been traveling throughout South Dakota, Nebraska and North Dakota. No problems traveling this week although Tara has said she thinks she has felt the baby kicking every once in awhile. We return back to Little Rock on Monday, April 4th. It was another brief visit and a check of the heartbeat. The baby's heartbeat was 143 beats a minute. The doctor again said everything looked great. This is Tara's 16th week of pregnancy. He said Tara was progressing as expected. He said our next visit will include a visit to radiology for the big ultrasound which will be on April 18th. Baby Dennie received a gift from Aunt Dana, Uncle Brad and cousins Jenna & Lilly. It included a decorative bowl, booties, and a yellow duck. We thought we might wait and share our big news with family and friends after returning from our spring break trip to the Dakotas at the end of March but it was becoming more difficult to keep the secret. We decided we would share our news with our parents by creating a "travel brochure." We thought we would say we had an upcoming trip that we didn't know where it would take us. We met my folks and Dana, Brad & Lilly for dinner at Grandpa's Catfish. I handed the brochure to my mom. She started studying it but didn't catch on so I finally told them Tara was having a baby! Of course, they were excited and maybe a bit shocked. Next, we stopped by Tara's parents and gave them the brochure. Again, we had to help them decipher the brochure. We stopped by Tara's grandparents and then made a few phone calls and visits with friends. We returned to the doctor for a quick check up. This is Tara's 12th week of pregnancy. After checking to make sure Tara has been feeling okay, Dr. Phillips checks the baby's heartbeat. Again, he said everything was in good shape and said he would see us again in a few weeks. We've anxiously been waiting to visit Tara's doctor. The day has arrived and we find our way to the Central Arkansas Clinic for Women. Tara has chosen Dr. C E Phillips to deliver the baby. 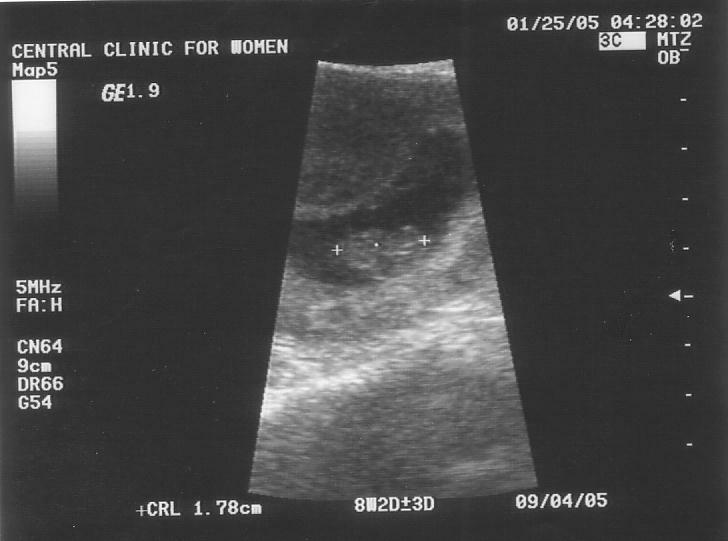 After performing a quick ultrasound, he said Tara was definitely pregnant. He said everything looked to be in good shape and he would see us back in a few weeks. I returned to work today after being off a few days for the Christmas holidays. When I got home in the afternoon, Tara said she had one more present for me to open. I found a baby bib and quickly determined we were going to have a baby! She called the doctor and he said to come in a few weeks to confirm the pregnancy test. We thought we might wait and share our big news with family and friends after returning from our spring break trip to the Dakotas at the end of March but it was becoming more difficult to keep the secret. We decided we would share our news with our parents by creating a "travel brochure." We thought we would say we had an upcoming trip that we didn't know where it would take us. We met my folks and Dana, Brad & Lilly for dinner at Grandpa's Catfish. I handed the brochure to my mom. She started studying it but didn't catch on so I finally told them Tara was having a baby! Of course, they were excited and maybe a bit shocked. Next, we stopped by Tara's parents and gave them the brochure. Again, we had to help them decipher the brochure. We stopped by Tara's grandparents and then made a few phone calls and visits with friends.